Where do you Start With the Internet of Things? From Bayesian Networks to Causal and Counterfactual Reasoning a talk by Judea Pearl. "... The development of Bayesian Networks, so people tell me, marked a turning point in the way uncertainty is handled in computer systems. For me, this development was a stepping stone towards a more profound transition, from reasoning about beliefs to reasoning about causal and counterfactual relationships. In this talk, I will survey the milestones of this journey, and summarize the practical and conceptual problems that we can solve today and could not address two decades ago. ... "
The Ultimate Big Data job? I don't know many of these positions around. The article does a good job in describing what they could be. Also a look at the differences between Chief Data and Chief Analytics Officer, but there is considerable overlap today in Big Data. And how these roles might exist alongside the CIO. Key would be a good interaction with corporate decision processes at a strategic and operational level. Innovation in fast moving technologies in context also needs to be considered. And in a services world an understanding of technology that is available and how it is evolving. If anyone wants to talk to me about developing this role, contact me. In CWorld: Very good points made here about the use of software libraries. Ran into exactly this problem a little while ago. Just because everyone can see the code does not mean they have incentive to carefully check it. Good caution.
" ... In the industries plagued by the most uncertainty, how do companies hold on to their ability to innovate? And how do they achieve, and keep, an innovation premium in the market? We found that managers who help their firms create and maintain an innovation premium use a different set of tools than their more traditional counterparts — tools honed in start-ups and specifically designed to manage uncertainty. .... "
Technology Review outlines technology breakthroughs in artificial intelligence. 2014 has been a very big year. We are starting to see real applications in practice, though many are still avoiding the term AI itself. It has been interesting watching this second wave. Capabilities and expectations have risen. In Information Week: Looking at how well companies understand their customers.
" ... It's no coincidence that supermarkets and banks, which have not just the technology but the expertise to utilize their databases effectively, scored the highest when customers were asked how well these companies know them. In poorly rated sectors, too many companies fail to access customer data, even when the technology to do so is available, and don't make good use of the information they do have. In many cases, that's because they rely too much on technology. In a data-led, digitally connected world, companies that lack the expertise to efficiently reach customers either need to get the right people or outsource this function. ... "
Systems, devices, and people now generate vast streams of data. How do we understand that data in real time?
" ... Remember the blackout during Super Bowl XLVII in February 2013? Nabisco certainly does. The company that makes Oreo cookies made history “winning the super bowl blackout” with its tweet, “You can still dunk in the dark.” That tweet resulted in tens of thousands of likes and retweets in real time—not bad considering that most advertisers pay approximately USD4 million/commercial slot during this event. Visit the Big Data & Analytics Hub to read the blog posting, “Reflections and Predictions for Stream Computing in 2015,” to see what Kimberly Madia, worldwide product marketing manager, InfoSphere Streams, at IBM, has to say about the impact that real-time data can have in today’s world. ... "
A virally spreading video a car Ad about a baby covered by a exoskin by Hyundai. This conceptual video demonstrates robotic assistance capabilities for humans. Most of the time these ideas are show with military applications. The baby creates a softer, human and domestic application of some of the same ideas. Protect, enable and augment the wearer. With both a physical exoskin and software. A little late, but quite a rich set of resources, slides and quality video. Have been involved in virtual makeover projects in retail since the 80s. And have seen attempts to take this beyond just how things look, to see if we can understand if a piece of clothing will fit via some virtual model. A look at a number of Apps and applications that do this. At very least reducing the expensive process of returns. And improving the level of consumer satisfaction. In Radar: Have always worked on the periphery of design, adding analytics as it was requested, but usually after the product development fact. It has always been been talked how we could link the two closely, but rarely done. Now we can be there.
" ... Design is entering its golden age. Now, like never before, the value of the discipline is recognized. This recognition is both a welcome change and a challenge for designers as they move to designing for networked systems. John Follett, editor of Designing for Emerging Technologies recently sat down with Matt Nish-Lapidus, partner and design director at Normative Design, who contributed to the book. Nish-Lapidus discusses the changing role of design and designers in emerging technology. As Nish-Lapidus describes, we’re witnessing the evolution of product development from one crafts-person, one customer; to a one crafts-person, many customers; to a one craft-person, one product that many people will customize. He explains how the crafted object and the nature of design has changed, beginning with the pre-industrial era: ... "
After seeing and reviewing the movie about Alan Turing movie: The Imitation Game, I took my research obsession to looking further at Joan Elisabeth Clarke, Turings sometime fiance, and colleague at Bletchley Park during WWII. She was also an award winning Cambridge mathematician. Portrayed in the movie by actress Keira Knightley. In her WP article it was mentioned that she was a cryptanalyst and a practitioner of what was called Banburismus, a method used to simplify code breaking. Expanded by Turing and possibly improved by Clarke and other members of the team. Some of this work is still considered confidential. There is a lengthy article about the Banburismus process in the WP. A fascinating look at how a polyalphabetic substitution cypher based on the wheels of the Enigma machine could be simplified with a hand and visualizing algorithm. The article even gives several examples. Leads to an appreciation of how difficult this method was without programmable computing. Also an early look at text analytics. Further, it is mentioned that this was a development of the 'clock method', developed by Polish cryptanalyst Jerzy Rozycki. Pointing to the key work done, barely mentioned in the movie, by the Polish group. In BaselineMag: My view: CIOs are moving from technology based solutions to services. Demand will still continue to rise, but results will be more carefully positioned and measured. I believe that this will mean that the solutions proposed will have to be more closely connected to business process. These look mostly like mega-tasks in the form of Apps. Mostly data based. Would like to see a selection of them that are more strongly cognitive powered. Have we considered how they might be linked together as tasks that form a job? Or designed as microservices? Great start to make us think the architectural issues . In Forbes: This relates to the set of sample Apps written to address specific enterprise tasks. What they really will be saying, of course, is “make it like Apple,” but the Cupertino brand has not made inroads in the C-suite like it has in the psyche’s of consumers. Executives and their minions are consumers too, so Apple’s products are well-represented in the enterprise, but not yet well-supported by IT departments. .. "
A new project called Data Collation and Integration for Public Health Event Responses (DCIPHER) is looking to change all that. According to the RFI, the CDC needs "a single electronic platform that integrates, manages, analyzes, visualizes, reports on and shares key surveillance, epidemiologic, laboratory, and environmental findings during public health investigations and responses." The Ebola outbreak isn't mentioned in the RFI, but it does come up in answers to vendor questions about how the system would be used to gather information on individual cases and events that fall outside of routine surveillance activities. ... "
" ... Good or bad, the social efforts of CPG brands tend to inspire the strongest consumer responses, according to Kate Dunham, a content marketing specialist. In the CPG category, Cottonelle and Avon also hit it out of the park — with positive social sentiment rankings of 52% and 50%, during the holiday season. Big losers included Clorox (with a negative social sentiment ranking of 21%); Pine Sol (with a negative ranking of 16%); and Vaseline (with a negative ranking of 11%). ... "
In CACM: Have been involved in a number of re-architecture problems for the enterprise, and I generally agree. Lakes have docks and roads running around and through them. Swamps grow up around and within spaces depending their elevations and water table, with little planning. Its usually the latter, even after following up years later. In Future of CIO: by Pearl Zhu. Is it a mindset that you want? What will you achieve by having this? " ... independent thinking includes "not depending on the authority of others for forming an opinion." ... Making up your own mind, in other words. In more detail, what does “IT” - Independent Thinking really mean, and how to cultivate such a mindset? ... "
Learning more. Brought to my attention by Kilian Dill: A company that can make it happen: Stemgenics. " ... Stem cells can grow and develop into any cell type of the body. They are not rejected, but are accepted by the body as its own cells. In Stemgenics' breakthrough process, cells from a small patch of skin are placed in cell culture. Our patent-pending functionalized nanoparticles are added and the skin cells are reprogrammed into stem cells. ... ". More background. Saw the recently released Alan Turing Biopic yesterday. There were a few big errors in fact and emphasis. Like barely mentioning the key Polish results in solving the Enigma. Inferring Turing and his small team figured it all out themselves. Including the fact that a fundamental user error by the Germans allowed the code to be broken. In fact Turing then mostly made it more efficient to break the code by mechanizing the search for the machine settings. Movie showed conditions the security obsessed British would not have allowed. Like casually discussing their work in a public bar. Even a hint that they were working on it would have devastated the effort. Recall that most of the information about this era was not revealed until 50 years later, in the 90s. I read about some of it then. The agreements in the 1940s NDAs involved were largely kept. Turing's 'girlfriend' played by Keira Knightly, was too model-like. A sexism lesson was required, and made, though many women had been used at Bletchley before. Admittedly not in 'management'. Some obvious, melodramatic and 'just so' solutions were depicted. His 'computer' was very special purpose, but implied to be much more. His Turing 'Machine' was a fundamental thought experiment, but that was not adequately differentiated or explained. There was an excellent depiction of why once you broke the code you had to statistically dole out its use, to have it be of any value at all. Effectively choosing who would die in a very hot war. Few people understand this. But this has a real data asset management and valuation message, even today. See link on this topic below. The deep irony of AI and imitation game concepts mirroring his own sexuality were also well done. Ben Cumberbatch was superb in presenting a quirky geek. But I am splitting hairs, you can't explain a complex life in an hour and forty minutes. Overall one of the best tech bio pics I have seen, despite the flaws. Was surprised to see it in a crowded theater. Thought it would not be many peoples cup of tea. See it if you can. More on Alan Turing in this blog. Successfully scaling a business requires developing an organizational culture and effective processes, writes Hayagreeva Rao of the Stanford Graduate School of Business. "There may be nothing more crucial to a scaling organization than creating a strong sense of accountability, the idea that 'I own the place and the place owns me,' " Rao argues. ... "
A very complete article on the history and current market of deodorants. An old and stable market. But now Unilever claims a new aerosol innovation. Interested because of my long time connection to CPG marketing. But also because a relative worked for the early inventor of the aerosol spray in consumer products. A look into CPG innovation. In ComputingNow: (The original article is missing, will seek to replace) Thinking about the concept of an Internet of Services. Look at ISSIP, The International Society of Service Innovation Professionals group for pointers on how innovation is evolving. I have given a talk to that group. A combination of technology, data, people and delivered intelligence. The internet connects things, but it also modifies how these things interact with services. That interaction is key to understand and innovate in. A frequent topic here. In Retailwire: Looking at retail technologies in 2015. I agree, these are all key areas to monitor. Technology will continue to sculpt these areas, as they will many others. The comments are also instructive. Vincent Granville makes some provocative statements about the interaction of statistics and data science. I often worked with professional statisticians for problems that had regulatory dimensions, and they would have disagreed here. Yet analytics applications have always picked and chosen methods that provided the best results, with the data available and the kind of decision being modeled. Faster methods and more data have allowed us to broaden our choices. What we used was certainly in his list of methods. If these are old or new statistics is a matter of opinion, often dependent on your training and experience. Useful piece to read. In Sciam: Productive Illusions? Using immersive virtual reality to change our impression of realty, present and past. The general idea has also been experimented with for other kinds of psychological remediation. What 3-D Printing Means for the Independent Inventor. In Entrepreneur.
" .. Inventing is an iterative process. An entrepreneur learns by trial and error. Prototyping, whether through traditional means or 3-D printing, means the inventor must be aware of how each component affects the overall product, for better or worse. The use of 3-D printing has the ability to streamline this process in a timely and cost-effective manner. Design challenges and proof of concept viability become more apparent and drawbacks can be quickly remedied. ... "
A different kind of eye tracking. Non conscious reactions that are also related to other neuromarketing methods.
" ... Abstract: The present study proposes arousal as an important mechanism driving buying impulsiveness. We examined the effect of buying impulsiveness on arousal in non-shopping and shopping contexts. In an eye-tracking experiment, we measured pupil dilation while participants viewed and rated pictures of shopping scenes and non-shopping scenes. The results demonstrated that buying impulsiveness is closely associated with arousal as response to viewing pictures of shopping scenes. This pertained for hedonic shopping situations as well as for utilitarian shopping situations. Importantly, the effect did not emerge for non-shopping scenes. Furthermore, we demonstrated that arousal of impulsive buyers is independent from cognitive evaluation of scenes in the pictures. ... "
In Engadget: Nice idea to add to the internet of things for the home. " .... D-Link's latest smart home hub lets you add devices with a scan .... "
Thinking of Robots collaboratively, even at the simplest level. Researching indoor service robots. A Carnegie Mellon researcher shows that designing robots to ask for human assistance can make them a lot more useful. Upselling and cross-selling your travel product not only optimizes profits but also enhances your customer’s travel experience and loyalty. Getting it right is a huge opportunity for revenue managers and marketers to engage customers and drive higher revenues, but where do you begin? In Forbes/ HBS Working Knowledge: Good, short item on the current state of neuromarketing. Still not clear from this how this is better than or effectively combines with classical methods. By the time you decided to buy a product, you knew both what you were buying and how much it cost. But was your decision affected by whether you saw the price or the product first? That’s the question at the heart of new experimental research that uses neuroscience tools to shed light on how our brains make purchasing decisions. ... "
By Michael Schrage in the HBR. Good point that is rarely directly first considered in innovation. How do we test this idea? " ....the successful innovators I observed spent less time on identifying and developing good ideas and more time testing their hypotheses. In fact, these teams and groups made the testable business hypothesis the center of their innovation effort. ... "
A press release of nearly a year ago that I reviewed for a meeting with a client in the last few weeks. What does it mean for a company to do discovery on a combination of its own knowledge and data and public information? This press release inspired a number of people to ask questions like: How do we test this process? Re-evaluating that in the new year.
" ... IBM is unveiling IBM Watson Discovery Advisor. The new service will help industries such as pharmaceutical and publishing do more with their R&D investments while empowering research teams to accomplish more in far less time. The Discovery Advisor is designed to reduce the time researchers need to formulate conclusions that can advance their work, from months to days and days to just hours. The Discovery Advisor will call upon Watson’s cognitive intelligence to save researchers the time needed to pore though millions of articles, journals and studies. After quickly reading through, determining context and synthesizing vast amounts of data, it will help users pinpoint connections within the data that can strengthen and accelerate their work. .. "
In McKinsey: What will AI mean to management, to the executive suite? A long term question we examined for a long time. They have some interesting points. It is not only about managing key knowledge, but it is about understanding decisions, injecting creativity, even leadership. And, most difficult, managing the interface between man and machine in ways that are beyond simple resource use. In CWorld: Implications of more data and the need for methods that can understand sensor data at high speed and the intelligence to make decisions. Inspired by Biomimicry.
" ... The FLA drones are supposed to be quick, independent robots who can create and follow their own search patterns, react correctly to the things they find and report back to operators who may have had to do nothing but watch the video feed as the FLA 'bot searches. That sounds as if DARPA is looking for more than simply real-time sensor-data processing. Building a bot that can read a situation, navigate through it and respond to particular stimuli – identifying flood survivors clinging to debris, for example, and signaling for help – requires something very close to a low-order artificial intelligence comparable to the birds or bugs DARPA uses as examples of what it wants, but without the self-awareness and self-determination obvious even in birds. ... "
JP Morgan was burned by not implementing it everywhere. So it is a good time to enable two factor authentication security for passwords. It is not perfect security, but it is a necessary first step. Just did it myself. It is very easy to do for many systems. Braden Kelley makes some good comments on the speed of change in Innovation Excellence, Statistics on change. I have wondered if we are ultimately slowing down. Further the gap between consumers expectation of changes and how quickly companies can provide solutions to needs.
" ... A well-known problem in the Internet of Things is that many connected devices operate in silos. Your Fitbit doesn't communicate with your Nest thermostat, for example. One way some companies are trying to solve this problem is to create a hub, like Revolv. The idea is for all devices to connect to the hub, which serves as a central point for users to control all the devices and allows certain events to trigger activity in different devices. Neura, a startup chosen as part of Microsoft Ventures' accelerator program, has a novel approach to the hub concept. "The phone and potentially in the future the watch is how we treat a hub," said Gilad Meiri, CEO of Neura. .... ". Baking intelligence into the network. Novel approach. In Adage: " .. Top Ad Spenders Pull Back in Third Quarter ... Internet Display Spending Fell 1.7% as Desktop Page Views Fell ... Top spender P&G has now posted three consecutive quarters of year-over-year spending declines. ... "
From the P&G Alumni Network. Large companies need to simplify and focus on profit.
" .. The Procter & Gamble Company today announced the sale of its Camay and Zest brands along with the transfer of a manufacturing facility in Mexico to Unilever for an undisclosed amount. The transaction is expected to close during the first half of 2015 subject to necessary regulatory approvals. P&G noted that the sale of both brands is consistent with its strategy to focus on its core brands that will create a faster growing, more profitable P&G that is far simpler to operate. ... "
Although I had seen TNS mentioning these approaches, here is a direct collaboration. The approach seems to be a combination of EEG and eyetracking methods.
" ... TNS has long been associated with its strong brand and communications offer. The marketing research company has now taken this a step further by combining its brand and communications understanding with neuroscience to get to the heart, or brain as it were, of what people are thinking when they make decisions. Partnering with HeadSpace Neuromarketing has given TNS the ideal opportunity to validate its communications testing approach based on neural theory. Underpinned by science, the company's approach moves beyond what people claim is the reason for their brand decisions based on rationalisation after the fact, to get closer to the truth based on their unconscious responses to advertising. ... "
In Mediapost: Most interesting idea, especially as it deals with a perhaps unique path to conversion. Very interesting problem from an analytical point of view. Includes where interactions occur on the journey. Read the rest of the article, more details and statistics. Details of the data being used to derive the prediction is unclear. [ Update: The link below mentions the data used] A form of retail oriented user model? Looking further, hope to find out more.
" ... In an attempt to better understand the path to purchase, Google released an online tool that enables marketers to predict the journey in which customers will take to make a purchase. The tool, The Customer Journey to Online Purchase, allows marketers to explore for businesses how any of the 14 industry channels influence purchase decisions. The tool enables marketers to pick from 14 channels including Arts & Entertainment, Fitness & Beauty, or Law & Government, as well as the size of the business, small, medium or large, in a variety of countries such as the U.S., Brazil or Japan. For each market, channels such as social or paid search are posted toward the left of the graph based on the country and business size. ... "
Numenta has developed a cohesive theory, core software technology, and numerous applications all based on principles of the neocortex. This technology lays the groundwork for the new era of machine intelligence. Our innovative work delivers breakthrough capabilities and demonstrates that a computing approach based on biological learning principles will make possible a new generation of capabilities not possible with today’s programmed computers. ... "
Previously about Numenta. And in the Wikipedia. Remember visiting HP Autonomy in the UK in the 90s. Was impressed what they showed us. Analytics being used with AI and Bayesian methods. First time I had seen these approaches being used with real corporate data. Proposed it for use, but it never happened, in part due to the financial flap. Now was this due to mere accounting differences and not fraud? And all much ado about nothing? Too bad if so, I liked what I saw then. Designed for the commercial aviation market and for the Clearvision EFVS family, Skylens is a lightweight wearable device consisting of a visor large enough to fit easily over the pilot’s glasses that displays high-resolution data, symbols, and video. Elbit says the Skylens can be retrofitted to existing systems in airplanes and helicopters to provide an augmented view of the outside world with data laid over what the pilot sees – or can't see. ... "
In the CACM: More simply put, it's about people and their tools. Now smart tools that are getting smarter. And unexpectedly, new forms of autonomy are emerging too. A lengthy and interesting piece on the topic.
" ... We call this emerging class of systems human-agent collectives (HACs) to reflect the close partnership and the flexible social interactions between the humans and the computers. As well as exhibiting increased autonomy, such systems are inherently open and social. This openness means participants need to continually and flexibly establish and manage a range of social relationships. Thus, depending on the task at hand, different constellations of people, resources, and information must come together, operate in a coordinated fashion, and then disband. .... "
Update: A video on HAC's. Interesting in the video is a mention of the use of levels of autonomy for the Cogs being used, in the form of exploratory drones for disaster response. Also the use of emotion classification for interaction with humans on site. Useful for guiding any Cog-Human interaction scenarios. Reminds me of the Behavior Modeling services being provided today in Watson . All this is then combined in a simulation game. Useful components in any complex, predictive scenario system. In BiCorner: A recent meeting made it clear that enterprises are seeing the Hadoop ecosystem this way. Was surprising to me. Very good introduction to that ecosystem as it exists today and why that matters.
" .. Display Solution, based in Gilching, Bavaria, Germany, is a leading developer and marketer of customized LCD solutions for existing and future markets, combining leading-edge screen and electronic technologies. Products range from single components to complete system solutions built around TFT displays for commercial and industrial use with application in such areas as digital signage, point-of-sale, point-of-information, automation, measurement engineering, medical instruments, and other mobile and embedded applications. ... "
Blockchains. This was new to me, then heard it mentioned several times in one week. " ... The blockchain is a new organizing paradigm for the discovery, transfer, and recording of all quanta (discrete units) of anything, and the decentralized coordination mechanism to possibly scale humanity to its next levels of progress. ... " . I see it is also a Bitcoin wallet. What other examples of the concept's use exist outside of the Wallet? See the the link for a broader view. In McKinsey. On big data and manufacturing. Talked that just yesterday with an enterprise. It is clearly a challenge. Lots of unstructured data is common. It becomes unusable quickly. But they understand it can be used to answer questions previously untenable. My question is always: Who is asking the questions? How do I connect them with the answers?
" ... Advanced analytics refers to the application of statistics and other mathematical tools to business data in order to assess and improve practices (exhibit). In manufacturing, operations managers can use advanced analytics to take a deep dive into historical process data, identify patterns and relationships among discrete process steps and inputs, and then optimize the factors that prove to have the greatest effect on yield. Many global manufacturers in a range of industries and geographies now have an abundance of real-time shop-floor data and the capability to conduct such sophisticated statistical assessments. They are taking previously isolated data sets, aggregating them, and analyzing them to reveal important insights. ... "
In Adage: Study Uses Data to Track Consumer Emotions When They Buy ... But Is Self-Reported Emotional Data Useful for Marketers? In Fastcocreate. Coversations come after you established a narrative. Striking up conversations isn't enough for social media marketing, Bob Deutsch writes. Marketers need to think in terms of the narratives they're building around their brands, and the ways in which customers can relate to those narratives, Deutsch writes. .. "
Flowingdata picks a number of examples. Not the most simple, but some of the most pleasing and artistic examples that are worth a look. As he notes, his examples are interactive, animated or both. I agree, this is our direction. Its not only showing the data well, but allowing decision makers to easly interact with the story that is being told. To extend the reach of the visualization and test implications. An AI rival to understand: Sentient: With some emphasis on big data and genetic methods. And the direct use of biomimicry through the use of genetic algorithms, an area we experimented in. He said Sentient combines technologies in evolutionary computation, which mimics in software the way biological life evolved on Earth, and deep learning, which looks at the way nervous systems are architected and work. These technologies are used either independently or together and are scaled across millions of nodes.... "
Understanding change implications, exploring possible organisational futures, choosing proactive responses today. If you're ready to think in new ways about the future get in touch to get started .... "
Printing chocolate. " ... Out of all the companies out there, one instantly pops into most individual’s heads when they think of creamy, rich chocolate, and that is Hershey. With the history, the market reach, and the drive within the company, it was only a matter of time before the Hershey, Pennsylvania-based chocolate producer would integrate 3D printing into its operations in some way, shape, or form. Today is that day! Teaming up with 3D Systems, Hershey has announced that on December 19th they will debut the 3D Chocolate Candy Printing Exhibit at the Hershey’s Chocolate World Attraction. Here, visitors will have the opportunity to watch and interact with scientists at the company as well as 3D printers spewing out the rich creamy candy.... "
In the WSJ: Amazon Unveils One-Hour Delivery Service. Program Is for Prime Customers in New York, Includes Over 25,000 Products. ... " . Additional charge. Expanding areas. Attempting to further own customer relationship. In Fastcoexist: A kind of biomimicry. We worked on related ideas when in the food business. " ... Scent Of A Rose, With Designer Microbes .... Stop and smell the genetically engineered yeast. .... ". Now for dealing with supply and cost constraints. In today's Cognitive Systems Institute presentation, Jim Hendler from RPI presented "An Academic Perspective on Watson.". Nicely done, in particular a comparison of the fundamentals of the expert systems we built in the 90s, and the Jeopardy Watson approaches of today. And a view of what Rensselaer Polytechnic Institute is researching today. Very well done, especially if you want to understand practical directions in AI. Not sure if this is rare. Have been part of related work for enterprises. In particular this could be best seen as a broader strategy about getting focused data to people that need it. Wherever they are. And once you have the data, it is also crucial to have a strategy for the related analytics that can be applied to that data. In CWorld: Early this year was involved with a proposed project with Google Glass that regrettably did not happen, read more about that here. Now Sony is competing with an hands free information model. Toshiba and others are already operating here. " ... Sony high-res OLED screen attaches to any eyewear ... Sony shows off latest SmartEyeglasses prototype ... sony smart glasses 620 ... Sony releases SmartEyeglass developer kit ... "
" .... As it happens, Power House was developed by researchers with the explicit goal of getting players to reduce their energy consumption in the real world. And it seems to have worked. In the January 2015 issue of Environment and Behavior, communications scholar Byron Reeves and three Stanford colleagues report that people who played Power House demonstrated more energy-efficient behavior immediately afterward—both in a lab and their own homes. ... "
A simple word cloud service, data can be retrieved from pasted text, URLs or files. A number of useful features for quick generation. Their blog provides some good usage examples.
" ... Within SAP, IoT has begun taking shape in the form of grassroots projects and pilot implementations to fully validated solutions with external partners. SAP Palo Alto’s IoT garden began with a simple vision and small budget: to automate the campus garden with consumer grade water and temperature sensors and a raspberry pi computer. By monitoring moisture and humidity, and combining the data with weather patterns, the project demonstrated how to set optimal workflows in the garden including how much to water, when to cover plants, and the suitability of certain plants given average sun and temperature patterns. The ultimate goal, as with most other IoT implementations, is enabling bidirectional communication so that collected information can be propagated back to the edge in the form of enhanced workflows. ... "
In the HBR: Using the activity of the brain to understand purchasing and marketing decisions. We called this neuromarketing, but that term is never used in the article. " ... Brain Marketing: Is the Product Worth the Price? Are consumers more likely to buy if they see the price before the product, or vice versa? Uma Karmarkar and colleagues scan the brains of shoppers to find out. ... " . The approaches described uses fMRI, while today most experimentation by retailers and manufacturers use very different electroencephalogram methods.
" ... By the time you decided to buy a product, you knew both what you were buying and how much it cost. But was your decision affected by whether you saw the price or the product first? That's the question at the heart of new experimental research that uses neuroscience tools to shed light on how our brains make purchasing decisions. ... "
In CWorld: " ... Already a major manufacturer of electronics, China is preparing to bolster its presence in robotics with the help of government support and investments. China's Ministry of Industry and Information Technology will develop a "robotics technology roadmap" as part of new government plans, the state-controlled Xinhua News Agency reported . ... "
In CWorld: New three dimensional design. Potential for IoT and Big Data applications.
" ... Stanford University researchers have built a multi-layered "high-rise" chip that could significantly outperform traditional computer chips, taking on the hefty workloads that will be needed for the Internet of Things and big data. Using nanotechnology, the new chips are built with layers of processing on top of layers of memory, greatly cutting down on the time and energy typically needed to move information from memory to processing and back. 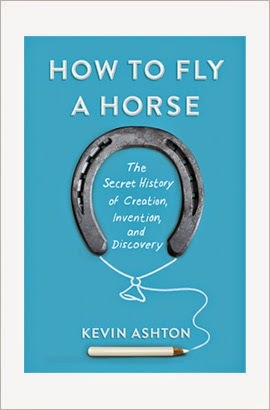 ... "
My new book, "How to Fly a Horse — The Secret History of Invention, Creation, and Discovery," comes out on January 20.
" ... n his new book,”How To Fly A Horse,” Kevin Ashton explores why innovators meet resistance and how they overcome it, why most organizations stifle creative people, and how the most creative organizations work. In a passionate and profound narrative that amazes and inspires, Ashton’s book sheds new light on how “new” comes to be. " Site, video, information and pre-order. I will followup here when I get a hold of it. In Adage: On how to measure digital content. Which relates to the more general aspect of Data Assets. Which I have repeated here and given a talk about. It's all about context in business process. It requires having some measure of the data, in a given context. How do we effectively do this in a way that can stay up to date? I want to know how the value of my data is changing, where that is headed, and even what data I don't have could be added to it to make it more valuable. Good piece on the topic. by James MacLennan. There is lots of talk everywhere of course, but what do you do to fit his into a business? We spent years thinking about this when it was mostly implemented with RFID. Now the parts of the system can be more intelligent. " .... where does a Business Unit (BU), a product line, an engineering team start the journey. Remember, industrial manufacturers historically (and quite correctly) see their role as “making & shipping Stuff”, and the shift to “providing & supporting Data-Enabled Stuff” is a pretty big leap. In addition, there are plenty of other things going on – there aren’t many teams with spare time on their hands, looking for a Next Big Project to fill the idle hours. ... As I make these connections with BUs in our organization, I am seeing patterns in how the product teams are adding Information as a fundamental part of their offering; they fall into these categories … "
An area we examined in laboratory conditions. One approach seen was the automated blurring of faces. In RetailWire: Discussion: " ... While privacy remains a big concern around in-store video analytics, stores are too much of an investment and cost too much to operate to run in the black hole of information that they increasingly appear to be in — especially compared to online. ... Lolli and Pops, the candy retailer based in San Francisco, is in the process of rolling out video analytics across the chain. It leverages Prism Skylabs' video analytics, which balances privacy versus the need for analytics by removing the people from the videos. ... "
In Mashable: " ... iRobot builds a vacuum-free Roomba for students to hack ... " This is a successor to the iRobot Create, which we used to experiment with simple robotic demonstration ideas. This version has no vacuum, so its simpler, cheaper. Can be hacked for experimentation with algorithms in Python, for which there is a experimenters community. "ALEX the virtual benefits counselor is America’s best-selling and most-trusted standalone benefits decision support tool. Used by hundreds of companies (including 50 in the Fortune 500), ALEX helps millions of employees make smarter decisions that save them—and their employers—surprising amounts of time and money." In InfoWorld: Four groups have been developing IBM Watson-like systems based on open source work. ... Watson wannabes: 4 open source projects for machine intelligence. These projects aren't as fleshed-out as Watson, but they're open source and ready to be built upon ... "
Covers and outlines: DARPA DeepDive, Apache UIMA, OpenCog and OAQA (Open Advancement of Question Answering Systems).
" ... The Analysis Division of Tobii Technology, the global leader in eye-tracking research solutions, announced today that it has started shipping Tobii Glasses 2 to customers around the world who had preordered the product earlier this year. The company’s newest wearable eye tracker is being distributed to Tobii customers, which include many of the world’s leading behavioral, usability and market research labs within top universities, private research institutions, technology companies, industrial companies and major consumer packaged goods corporations. Tobii Glasses 2 shows exactly what a person is looking at in real time, while moving around freely in any real-world environment. This helps broaden insights into human behavior with eye tracking in a wider range of research than before, including in-store shopper marketing, mobile testing, sports performance, knowledge transfer and social interaction studies. Because the Glasses 2 are so easy to use, they provide an eye-tracking solution of value even for those who may be using eye-tracking tools for the first time. ... "
In CWorld: This was part of our mantra in the enterprise with Business Sphere applications. " ... These CIOs are jumping on a fast-moving trend — mining small data sets to deliver valuable insights quickly to the right people at the right time. ... " But I add to that a few more requirements. ' ... Get the right data to the right people at the right time ...' And that includes required augmentation to the data ... metadata ... analytical predictions ... related expertise .... cognitively driven advice. Currently involved in several projects that are using these ideas. In CWorld: " ... Researchers are working on a new version of an algorithm that will power better search, autonomous cars, smarter smartphones and the Internet of Things. Deep-learning algorithms, which are based on loose simulations of the brain, have been used to advance technologies like speech recognition, natural language processing and robotic autonomy.. "
" ... Smart Service System submissions would be most welcomed at the Service Science, INFORMS Journal. Modern businesses rely on technology, communication, information, automation, and globalization. They operate in a complex web of suppliers, customers, and other stakeholders, creating value by sharing skills and capabilities with others for mutual benefit. Service science is the emerging study of such complex service systems. It involves methods and theories from a range of disciplines, including operations, industrial engineering, marketing, computer science, psychology, information systems, design, and more. Effective understanding of service systems often require combining multiple methods to consider how interactions of people, technology, organizations, and information create value under various conditions. .... "
SciKit-Learn: Was given an arrangement of algorithms in Python awhile back for examination and could have used this. Tutorials, examples and more. " ... Open source, commercially usable - BSD license " . Below their often quoted 'Cheat sheet', click to enlarge. It is still a very important, vibrant place. Even understood after I spent all of today shopping online. In Marketing Mag. " .... Everyone might going crazy for digital these days but that shouldn’t mean we neglect bricks-and-mortar, writes Rosemary Chegwyn. Here she identifies some important considerations when creating point of sale (POS) solutions. ... "
Nice simple introduction with examples. The WP defines " ... A NoSQL (often interpreted as Not Only SQL database provides a mechanism for storage and retrieval of data that is modeled in means other than the tabular relations used in relational databases ... "
Recently have seen the emergence of mirror style systems, where a system can look like me and I can use that idea to market and advertise. But suppose I had a system that could think like me? Logically (or not) , but also include all my habits, likes and quirks? Derived from loyalty data. Or Twitter streams. Not quite what this system does, but it is the first thing I thought of when I saw the piece. It also makes me think of agent based models we had written designed to mimic consumer behavior. (See Agent Models Link below) Perhaps this could be another starting point for those approaches. Yes, creepy too. Ritchey, T. (2014). “On a Morphology of Theories of Emergence”. Acta Morph Gen, Vol. 3 No. 3. Abstract: “Emergence” – the notion of novel, unpredictable and irreducible properties developing out of complex organisational entities – is itself a complex, multi-dimensional concept. To date there is no single, generally agreed upon “theory of emergence”, but instead a number of different approaches and perspectives. Neither is there a common conceptual or meta-theoretical framework by which to systematically identify, exemplify and compare different “theories”. Building upon earlier work done by sociologist Kenneth Bailey, this article presents a method for creating such a framework, and outlines the conditions for a collaborative effort in order to carry out such a task. A brief historical and theoretical background is given both to the concept of “emergence” and to the non-quantified modelling method General Morphological Analysis (GMA). Have recently been asked to look at grocery delivery capabilities. We saw these as common components of the future home, but they have not developed as quickly as expected. Now here a practical recent comparison. In GigaOM. Good thoughts about the topic. Predictions of its state in the coming decade. Not much different between classic forecasting, analytics, or the use of Big Data. Caution and careful testing in comparison to current approaches in a given business model is always needed.
" ... Probably the most interesting related business idea is Adam Cheyer's (co-creator of SIRI) (http://viv.ai) which is trying to what you are describing below - sort of, first for "apps" in a way they get combined; Adam has innovative ideas on the business model. If you think of apps as microservices, then you may have 50 apps that do the same thing (e.g., recommend a restaurant) - and just like Watson pipeline can combine and score, so would viv.ai, and then pay out a little to each in accordance with how helpful they were to the end user. ... "
In IEEE Computing Now, a new effort of very broad application. Look forward to following this. Technology is born of inspiration, of dreaming the impossible. But there is still an opportunity to use technology to solve societal challenges. Games have this potential. Inspired By Games is focused on showcasing new applications, innovative game design and leading-edge technology in the hope of inspiring others to break rules, cross boundaries, collaborate across the globe and explore cross-disciplinary applications of the arts, culture, science, enterprise, and education. .... "
Plan to take a further look at the idea. " ... Big data by itself is just a worthless collection of numbers and characters. To make big data work, you need to show how the information is meaningful. Taking a storytelling approach to analytics is one way to put big data in context. .. "
Drones have just found their new best friends: coders. On Oct. 13, the Linux Foundation unveiled a nonprofit organization called the Dronecode Project, an open-source development initiative uniting thousands of coders for the purpose of building an aerial operating system for drones. Hopeful that the project will bring order to the chaos that has surrounded software developers as they sprint to carve out a share of the bourgeoning market for unmanned aircraft systems (UAS), UAS operators are now asking whether Dronecode will finally provide the horsepower and industry-wide support needed to launch a universal drone operating system. ... "
Google product strategist Scott Jenson said that the problem the Physical Web is designed to solve is one of scale. Finally got a bit closer look at this effort. A good example of an advisory system. Announced this past July. " ... IBM and USAA announced Wednesday that IBM Watson is taking on the challenge of advising US military personnel on a range of financial and life decisions when they decide to transition to civilian life. ... "
A very good direction, working with infrastructure is often more complex than it should be. NSF announces $31 million in awards to develop tools, cyberinfrastructure and best practices for data science .. The ability to collect and analyze massive amounts of data is rapidly transforming science, industry and everyday life, but what we have seen so far is likely just the tip of the iceberg. Many of the benefits of "Big Data" have yet to surface because of a lack of interoperability, missing tools and hardware that is still evolving to meet the diverse needs of scientific communities. .... "
Attended a talk today in the Cog Sci Institute on the status of work being done at Ga Tech on Biologically Inspired design, or Biomimicry. Given by Prof. Ashok Goel Most often examples in this space look at how designs in nature can be used to address specific human engineering problems. Most of what they are doing today is trying to understand how human knowledge about biology can be retrieved to address engineering requirements. The problem is that engineers and biologists don't speak the same technical language. Also, we need to understand how to search and reason by analogy in both domains. The extension of analogy is a form of creativity. We researched reasoning by analogy when addressing consumer needs. This can then be linked to cognition, as part of Human centered computing. All this is a crucial part of AI. There is much more work to be done. It seems like I have been experiencing increasing numbers of bad user experiences lately. ComputerWorld writes about the bad UX in Apps. New standards need to be created and broadly applied. Part one of an article on the early history of computing technology in the Boston area. As the piece suggests, it's often forgotten after the emergence of personal technologies in Silicon Valley. So this is positioned as a rise-and-fall story. We spent some time with DEC in the NE at that time so some of the players are familiar. Dan Bricklin's invention of the personal spreadsheet, and our lapping up its capabilities for accounting functions. Then the surprising failure of DEC to understand the personal computing revolution. Some of the details are revealing to our experiences then. Looking forward to the next chapter. In the HBR. by Thomas Davenport. This 2013 article suggested that analytics 3.0 would put us in an era of data enhanced analytics offerings. Worth re reading his proposed definition of 3.0. Are we there today? Not yet, but have seen some interesting startups that are pushing this capability. Will cognitive adivsory enhancement help find the right data to solve particular problem statements? The required standards and facilities are not there yet. What will it take to make this happen? BBC examples of stunning drone photography. Shows how the point of view is being extended into the third dimension for still photography. Impressive shots. In Knowledge@Wharton: Good overview of the current state of the IOT. " ,,, Stories about the Internet of Things — everyday objects that have been upgraded to send and receive data — are growing ever more common in the media, and for good reason. As a July post in the New York Times’ Bits blog commented, “Over the next few years, very little stands to be bigger than the Internet of Things, or IoT…. The IoT is expected to eventually touch some 200 billioncars, appliances, machinery and devices globally.” ... "
Update: Forbes Infographic on how IoT will influence us in the workplace. A video view of the future of cognitive computing in Japan. With an emphasis about the cognitive interaction between people and devices. In the retail and food service and financial sectors. Very nicely done. A strong assumption that understanding between people and systems will be without error and seamless, but that is a good target. Well done. Via Jim Spohrer. Was unaware of this classification. Here a working paper on a choice model for this approach. " ... There is growing interest in the economics of multi-sided platforms (MSPs), which-like eBay, Uber, and Xbox-get two or more sides on board and enable interactions between them. In this article the authors study firms' strategic positioning decisions between a multi-sided platform (MSP) mode and three alternative modes. The main focus is on the choice between operating in MSP mode and operating in vertically integrated (VI) mode. ... "
Lots of interesting currently operating examples are covered in the full paper linked to. On the must have skills for the data scientist. A pretty good overview, including some information about where to get more detail. I will emphasize: Either direct experience in the use of business data in that business sector, or the ability to cooperatively work with the people who have that experience. Also the assurance you will get enough time from these same resources. You will always have to work with a group that manages data and business process. You must have the STRONG ability to collaborate with these people. You will also have to sell any business solution to these same groups and their management. In Infoworld: Interesting review piece, bottom line its always about focusing on the business need. If you don't know that clearly, you cannot fix it. I am interested in hearing from any research faculty andt their grad students who are trained up on adding cognitive computing componentry to Bluemix - for open research purposes. .... "
Glad to pass examples along.
" ... 2015 will be the year that true shopper-centricity finally moves from concept to reality. How? ... A few leading food retailers will succeed in combining the one-on-one capability of loyalty marketing programs with the 24/7 functionality of mobile apps to create personalized food portals. ..."
Most interesting that consumers will be able to discover new products this way, even specify their development. The implication of the exchange of more detailed data between consumer retailer and manufacturer could lead to further innovations. More specific pointers of directions in new product development. Press release. Amazon competing with auction houses. But not an auction. Are there regulatory implicatons? Continued following of auction structures in this blog. See the Auction link below.
" ... Here’s how it works: Sellers enable the ‘Make an Offer’ feature for items to show customers they are willing to negotiate for a lower price than the price listed. When selecting ‘Make an Offer’ on an item’s product detail page, a customer can enter and submit a new price of their choosing. The seller will receive the customer’s lower price offer through email, at which point the seller can accept, reject or counter the offer. The seller and customer can continue to negotiate through email until the negotiation is complete. When a seller accepts a customer’s offer, the customer is notified and can place the item into their shopping cart at the agreed upon new price for checkout and purchase. ... "
Overview report on a recent Google sponsored conference in China on improving MOOC, with an aim to innovation. Particularly interesting, mention of measurement of hybrid learning models. Also the inclusion of better social and gamification models as part of MOOC. In Phys.org: We looked at this as a potential solution for laboratory spaces. It had its limitations, but has evolved to be a more intelligent process.
" ... You have to focus on educating your target audience if you are trying to create an industry, says Mark Organ, who founded marketing-automation company Eloqua. Try to engage with your early supporters, and be ready to act quickly once it's clear that you have hit on a winning idea .... "
In Retailwire: Lately have been looking at methods for determining the value of data. So this is a nice example that relates to the value of data for retail. It is a good case of linking value to business process where the data is used. Using analytics can point to leveraging the data or the process. In Adage: Nice piece that covers what Nielsen can and cannot measure. " .... Nielsen at a Tipping Point? Accelerating Change Confronts Methodical Researchers ... Viewers Falling Out of Nielsen's Core Competency: Live TV ... ". Points to the value of being able to do analytics against a rapidly changing advertising environment. A very simple example of RFID use in manufacturing. Simple examples make the best case for improvement. They can be extended later. " .... Audi Launches RFID Deployment for Tracking Assembled Vehicles Worldwide .... The carmaker has already installed the system at its Hungarian facility, enabling management to view where each car is in the finishing, storage and shipping processes, and reducing labor for drivers who locate and transport the vehicles. ... "
Thoughts by Microsoft and others. This was an area we examined assuming that RFID tagging would become ubiquitous. Tagging in some of the supply chain exists today. And we now have devices of all sorts showing their locations and status. The IOT will lead to a further spread of the idea. So how will this new transparency lead to more efficient supply chains? Have worked with large enterprises and startups addressing these questions. Fascinating computing news out of the Stanford mag.
" ... Stanford engineers take big step toward using light instead of wires inside computers ... Using a new algorithm, Stanford engineers can design and build a prism-like silicon structure that can bend light at right angles. The goal is to transmit data faster and more efficiently via optical rather than electrical signals. ... "
Some interesting points in a Knowledge@Wharton article. I much like the point made in the first para by the Walmart VP: " ... Want to Create the Next Great Software Product? Don’t Try to Innovate ..... Ben Galbraith, vice president of global products for Walmart, is surprised at how many people still believe that the best way to come up with new software is to “get a bunch of nerds and put them in a room until they produce a product.” In reality, he said at the recent BizTech@Wharton conference, successful software development requires active involvement by business leaders. ... "
I mentioned IBM's new EMail idea Verse. Now an article in the NYT about how they developed it and how they use it. The general brainstorming approach described is similar to the way we approached idea generation and discussion. It is common in Silicon Valley. It can work, but I have seen it be stifling.
" ... We did this for our new business email tool, IBM Verse, which helps workers prioritize tasks and find the right people and information quickly. We began not by declaring that we wanted to transform enterprise email, but by asking the team to think about what people dislike about email. ... "
Unclear then how Verse now supports this kind of brainstorming interaction. Have not seen it demoed yet, so can be objective. When you are not seated together and riffing ideas. Culture does create problems with brainstorming. Managers who understand this often excuse themselves from early sessions because they influence the process too much. Different people contribute in person than do in e-mail. In real-time is different than intermittent. There is much self editing and self aggrandizement. Visual drawing works differently on line. How can email deal with these observations? Late to this, but was impressed ... You can innovate. Having the pieces to innovate helps. But if you don't have them, you can invent them. In early 2012 a short film by Nirvan Mullick called Caine’s Arcade swept across the internet, bringing even the most hardened, cynical person to the verge of tears. The star of the film was nine year old Caine Monroy, who for a variety of reasons needed to spend his summer at his father’s used auto parts store in East Los Angeles. What would feel like a prison sentence to many kids, Caine saw as an opportunity. One day, he had the idea to fashion a kind of impromptu arcade from the empty cardboard boxes in his father’s warehouse. His fabrications were extremely intricate, featuring ticket dispensers, complex rules, and working panels and parts. Caine sold tickets to his arcade at $1 for four turns, but also dispensed what he called his “Fun Pass”, which would award the purchaser with 500 turns for only $2. There was only one problem: no customers. While many people came and went from the auto parts store, few people paid attention to Caine’s Arcade. .... "
In New Scientist: Because we were dealing with products that improved sensory interactions like touch, we were always interested in how to connect digital and sensory. Here another interesting example. " ... Feeling is believing. A system that uses sound waves to project "haptic holograms" into mid-air – letting you touch 3D virtual objects with your bare hands – is poised to bring virtual reality into the physical world. ... Adding a sense of touch as well as sight and sound will make it easier to completely immerse yourself in VR. And the ability to feel the shape of virtual objects could let doctors use their hands to examine a lump detected by a CT scan, for example. What's more, museum visitors could handle virtual replicas of priceless exhibits while the real thing remained safely behind glass. ... "
Astronomy is a science where understanding large amounts of data has been historically important. So it is natural that visualization has been important there. New examples here. See also: On the Future of the Pieces of Work. In Adage: Google mines search trends. " .... Two years ago, WPP's Mindshare created a tool for its client Kleenex that used Google search data to see where in the United Kingdom people were searching for things related to the flu. Based on that data, Kleenex was able to shift its TV ad spend to make sure people in those areas saw its spots. ... Now Mindshare has developed the tool into a full-fledged search-trend analyzer with Google. Called Search As Signal, the tool tracks what people are searching on Google, where around the world they're doing those searches and on what device and identifies trends. ... "
See also Mindshare's Loop Room, which futher looks at the delivery mechanism for this kind of data. Similarities to P&G's Business Sphere. Get the right data to the right people, in real-time. The topic of job displacement has, throughout US history, ignited frustration over technological advances and their tendency to make traditional jobs obsolete; artisans protested textile mills in the early 19th century, for example. In recent years, start-ups and the high-tech industry have become the focus of this discussion. A recent Pew Research Center study found that technology experts are almost evenly split on whether robots and artificial intelligence will displace a significant number of jobs over the next decade, so there is plenty of room for debate. ... "
Further, What are the jobs of today? See One Net for precise task descriptions of many. A great place to start to think about how these might be replaced in whole or part. Or how they can be augmented by advanced technologies. In Computing Now: Good view of the history of the smart phone. Where is this now so common device going? How will it fit into the needs of the future? " A move to an increasingly biometric device. While supporting health, work, entertainment and education. In Fortune: " ... Hershey turns Kisses and Hugs into hard data ... Hershey and its peers see data analysis from Palantir as an industrywide golden ticket.... But that’s not enough. A fledgling consortium of consumer packaged-goods companies led by Hershey wants to integrate its members’ individual data sets and analyze them with the hope that, collectively, the data can help all the companies better understand purchasing trends and come up with more cost-efficient global distribution models. As in the cybersecurity industry, it’s a rising-tide-lifts-all-boats mentality for companies that first want to be in the business of knowledge. ... "
The recently mentioned concept of microservices led to a conversation with Jim Spohrer of the Cognitive Systems Institute. He pointed me to a related idea of hyperspecialization. Hope you enjoy the reading and videos - all lining up on one thing - cognitive assistants for all occupations in smart service systems are on the way, and they will boost creativity and productivity of professionals, raising revenue per employee of companies and GDP of nations ... "
Correspondent Stefan Conrady of Bayesialab writes about the need for big data to go causal. I have been reading much about the topic recently See the Causation tag below. He writes " ... we are substantially expanding our educational program in 2015, emphasizing the critical importance of causal inference in the world of analytics. Unfortunately, many data scientists remain unconcerned about the critical distinction between statistical and causal inference. There is still little awareness of the requirements for proper causal identification and estimation. ... "
More on this and their educational program.